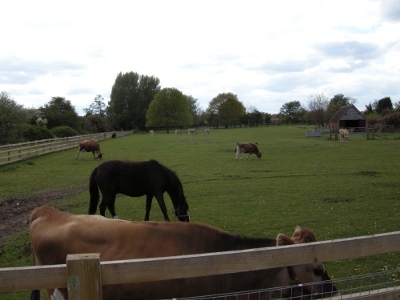 Sheldon Country Park is a council run recreational area with a working demonstration farm called “Old Rectory Farm”. The farm building was once the home of Reverend Dr Thomas Bray, the closest Sheldon has to a [18th century] famous person. There is a couple of public benches / seating areas within the farm area if you don’t mind eating with the smell from the farm (it’s not too unpleasant). 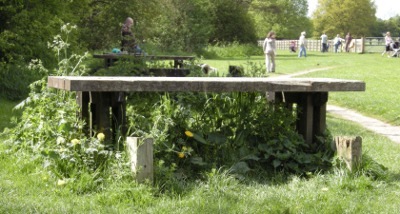 There were some picnic benches at the far side of the fenced grazing area in front of the car park, but they are not maintained and are now unusable. There is shade around that area if you have a picnic blanket, which is what we did. The first thing to note about the Old Rectory Farm is that it is a demonstration farm rather than a Children’ farm (most of the other farm reviews are on my baby and child pages are on children farms). This means there is no hands-on with the animals or any kind of interactive display. This is not a problem for a shorter visit, but it’s not the same as going to most children farms. Parking is free and it’s free to go around the farm. There is a small playground area and on most nice weekends and there is a bouncy castle costing 60p per child. There is also a cafe with tables inside as well as a few picnic benches outside (but no shade for the outdoor tables). 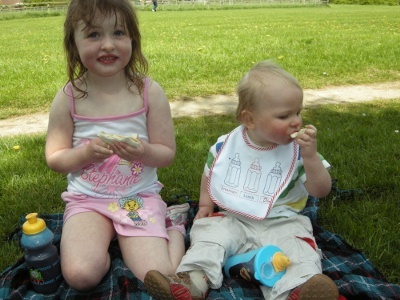 This entry was posted on Sunday, April 26th, 2009 and is filed under Babies, Children, Coventry West Midlands, Midlands, Tourism. You can follow any responses to this entry through the RSS 2.0 feed. Both comments and pings are currently closed.